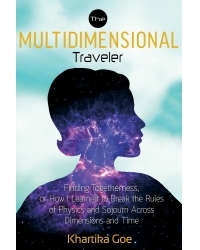 The Multidimensional Traveler is an inspiring journey that awakens readers to worlds beyond physical limitations. In addition to illuminating the existence of vast multidimensional realities, it provides specific examples of adventures through time, space, and the universes. Freed of limitation, you are initiated into the lost knowledge of multidimensional travel. It gradually expands readers’ consciousness so that they, too, may begin the awesome journey of discovering what lies beyond their physical body. Through discipline and practice, each and every one of us can regain the ability to travel wherever—and whenever—we wish! Discover your own multidimensional abilities and use them to their greatest potential. Connect with the force of togetherness to attain the true knowledge of the universe. Embark on your own multidimensional ventures, with the assistance of end-of-chapter instructional guides. The Multidimensional Traveler serves as a ticket to the world of limitless possibilities, reminding readers throughout the entire journey that their mind—like their soul—is indestructible, incomprehensible, and incalculable. Khartika Goe has evolved from a rigorous academic background into ardently writing on the unknown and the mysteries of the universe. She recently went public with her own accounts of dimensional travel in her groundbreaking article, “Adventures in Alternative Realities,” which was published in 16 languages and sold in more than 30 countries by Nexus magazine. Khartika completed her undergraduate degree at the University of California–Los Angeles and pursued graduate studies at Columbia University in the City of New York before embarking on her research on metaphysical dimensions. She is currently researching how different brain frequencies serve as a portal to other dimensions. Her website is www.thetogetherness.com.